I think I had a poster like this when I was 8. — This is more me reading between the lines (and maybe even a dash of wishful thinking) than anything Chizik said directly, but between the “Mike did a great job at the end of the game” and “our tailbacks should be our leading rushers” and “Hell no I don’t want Newton carrying the ball 20 damn times a game” (that last one’s something of a paraphrase), I’m betting we see Mike Dyer take over a much larger share of the workload this week. You read this, and I don’t think you can feel any other way. This is a good thing, of course; Newton can’t keep banging away as often as he has, and while I’d love to see Fannin break out, Dyer’s just been better to date. It’s time, and I think the coaches know it. If he finishes with any fewer than 15 carries Saturday, I’ll, uh, I’ll admit I was way wrong. — It’s a surprise to me after Newton took a lot more legitimate shots from the Bulldogs, but he said he was more sore after Week 1. Good news, I suppose. — Color me not entirely concerned that Josh Bynes played the entire game Thursday. Yeah, it would have been great if he’d gotten a blow, but we all know the dropoff from Bynes to Harris Gaston is, well, dramatic. In the sort of game where one blown tackle or assignment could equal DEATH, I don’t blame Roof at all for telling Byens he can rest against UL-Monroe and Chattanooga and some other game where one play won’t decide things. Besides: State took 68 snaps and Arkansas St. 84. Unless the backup LBs were in on even more plays than I thought, Bynes probably played just as often against the Red Wolves, give or take five snaps or so. — Interesting that Chizik mentioned John Sullen as a possible replacement for Ziemba, even after Mosley shone the other night. Clearly, Sullen is a kid the coaches have a serious soft spot for. — That Mario Fannin is in “the same status” as Ziemba is encouraging, since Lord knows we’re going to need him as a receiver, H-back running threat, pass-blocker, etc., even if things don’t work out at tailback. 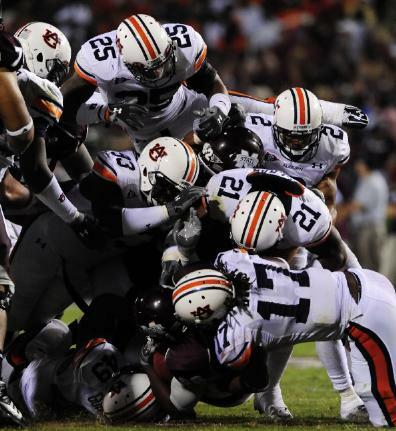 — Nick Fairley’s your SEC Defensive Player of the Week. If he hadn’t have been, I’d have been happy to lead the riot at SEC HQ. — Auburn press box fixture Tex Williams has passed away. Jay Tate has the story. — Chizik on Trovon Reed: “We’re working in that direction. We really want that to happen. We would like that to happen, yes.” That’s still not the same as “he’s going to play,” is it? Sigh. — Lastly, the South Carolina game is set for ESPN, 6:45 central. Which, hey, sweet. I notice you never refer to Woodberry in your beat rundown. Is there any particular reason for this? Just curious. Love the blog. Ken, nothing personal, his focus just seems to be on larger-scope articles these days rather than the team’s day-to-day ins-and-outs. I think the Times/News/Register has decided to have Goldberg fly the beat route solo. Wow Jerry I just saw that you did an article for Al.com. While I can say that I’m proud they’re giving you some well-deserved love, it was still pretty funny seeing the same ole blog bs over there. Don’t get me wrong the article’s are informative (well Charles Goldberg’s anyway) but I don’t venture down to those comments much. War Eagle. Bleh – 6:45 PM for the South Carolina game is most definitely not “sweet”. For those of us that live in ATL (which is a lot), that means a 7:45 PM start and a very, very late drive home (after a very, very early drive into Auburn to park at the tailgate). Not trying to be an old fogey here, but I’ve been nervous about this since the ESPN deal’s inception. For some reason, Auburn seems to get a disproportionate amount of the late ESPN and ESPN2 games when hosting on campus. I know the TV exposure (and money) is great, but it would sure be nice to have a fall AFTERNOON that I could enjoy in Jordan Hare that wasn’t up against a tomato can. It would also be nice to be able to bring my son to a game that matters before he turns 10. This is the exact reason that my parents (season ticket holders for 25 years) stopped coming to the games (and they had a central to central time zone drive). Very sad, really. And it doesn’t seem that the folks in charge really give a damn. Smyrna, I hear ya. I know Will Collier has had the same complaint. Maybe I should be more sensitive about that; I’ve just always personally preferred night games, whether I’ve lived in Auburn or elsewhere. The problem is CBS’s exclusivity window–they won’t let any other game be televised at 3:30, and since they’re all televised these days, that means the only time Auburn plays a home date at 3:30 is if they’re selected as the CBS GOTW. That hasn’t happened much these past couple of years. So it’s either a noon or evening kickoff, neither of which makes very many people happy, unfortunately. BD, yeah, I’m doing that once a week over there to hopefully sway a few readers in this direction. Jerry, You are on al.com?…..Nooooo, that means al.com has some credibility now.